Not much to report today. We did wander into town for about four hours yesterday for lunch, shopping, and picking up food for our in-room supper tonight. 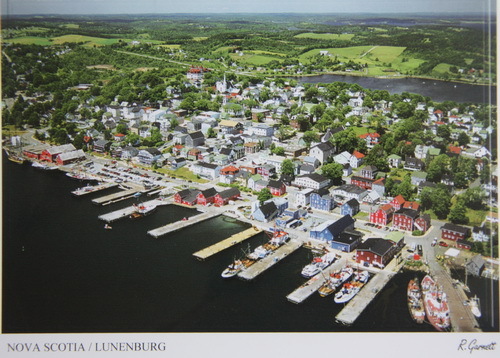 Lunenburg is a very picturesque town as shown in this picture I bought. It was set up by the British in the early 1700s so establish an English foothold into the French dominated territory. Spent the rest of the day lounging around the motel room. We had dinner in our room consisting of some kind of lunchmeat of which I didn’t recognize and oreo cookies. We will be going into Halifax today for sightseeing. Right now Yvonne is on the fence as to whether to move to a motel around Halifax or do the two hour round trip to here and back again tomorrow. One thing I have learned about my wife’s decision making is that it is a very last minute thing. My wife did decide to leave the motel in Lunenburg and to head to Halifax. It was about an hours drive east. We went to the Citadel and the Public Gardens in the city and then tired of the urban environment decided to leave Halifax and head further east. We ended up about an hour east of the city. This was basically the first motel we came to on a very desolate road. Fortunately there is also a restaurant here that doesn’t close until 8pm so we are set for dinner. I couldn’t tell you the name of the town; we passed through scores of them. Each named town typically had maybe five or so houses and nothing else. The town we are in now does have this motel with restaurant and a gas station so it is a major hub in the area . But most importantly as far as Yvonne goes it does have a view of a cove off the Atlantic Ocean although she won’t admit that it is actually better then the one we left this morning. So here we are again in the sticks for tonight but at least I think I have internet access (I will know as soon as I try to upload this post). Tomorrow we will likely head north to the mainland access for Nova Scotia and then down into Maine. It will be nice to get back to the U.S. and to our de-valuated dollar. One good thing about this trip is that the money we converted to Canadian dollars two weeks ago has actually increased 3% in value since we left (that is the Canadian dollars that we are holding are actually worth three cents more than when we exchanged them two weeks ago). It would have taken more than five years to have gained that much value in our savings account! And the journey goes on again…..